On our road trip to Tennessee from Texas, I was excite to travel through a few major US cities that I’d never been through before. 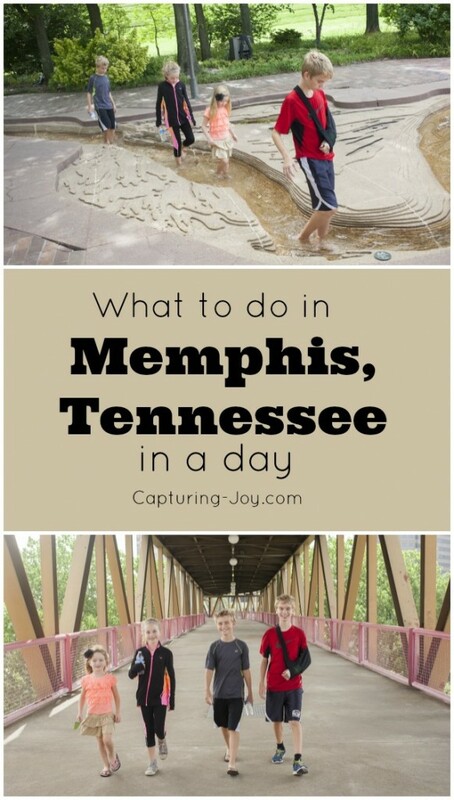 One of them was Memphis, Tennessee, and once I realized it was only about 7 hours from Dallas, Texas (3 hours from Austin) I saw this whole trip as much more d0-able. 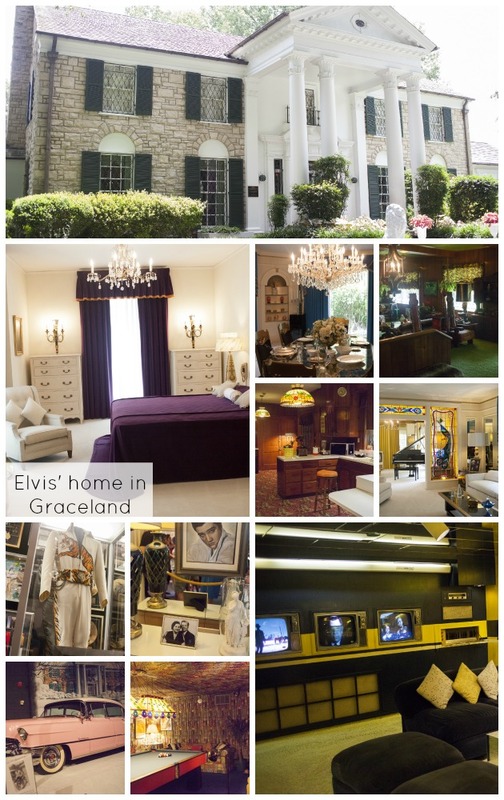 All I really knew about Memphis was that Elvis lived at Graceland, so that was HIGH on the list of places I wanted to visit there. I did a little research and Facebook polls, and found out there were a few other spots that would be fun to visit. This is what we did in the 24 hours we were in Memphis. 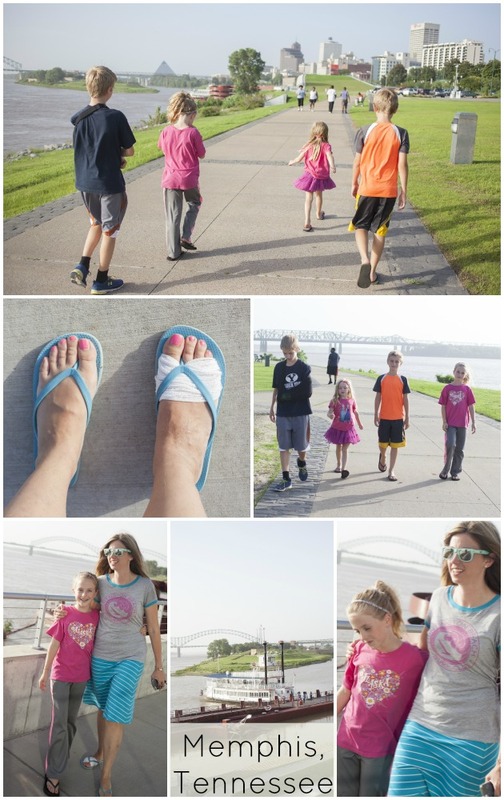 We arrived on a Monday afternoon after 5pm, parked along the Mississippi River, and enjoyed the view of the bridges and downtown. We were mostly stretching our legs from a long days drive. There was a nice paved trail that I thought would be so fun to take a little run along. I was kind-of hobbling, as I had stitches in the bottom of my foot a few days before, to remove a sliver that got stuck deep down. After we worked up an appetite, we had gone to the Visitor’s Center, and asked for suggestions for a fun and unique/kid friendly meal we could eat downtown. 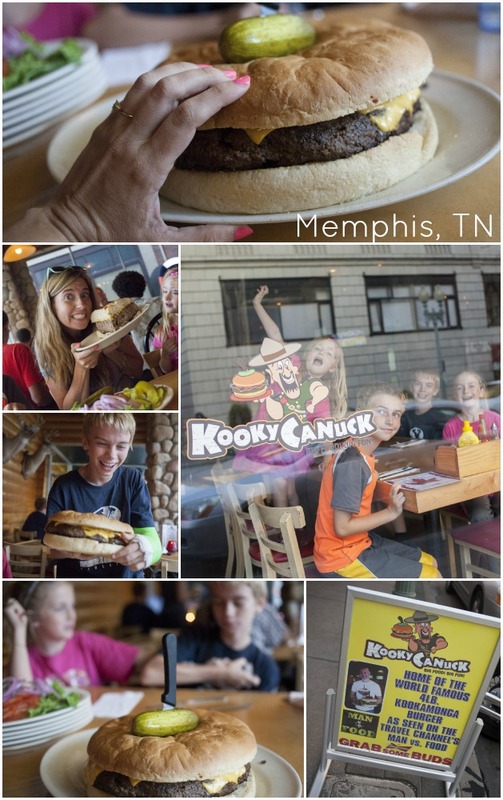 We heard about Kooky Canuck’s GIANT hamburgers, and I knew it was the place for us. The kids thought this GIANT (4 pound) hamburger was so much fun! We split it into 4, which was still a bit too much for each of us! We stayed at the local Comfort Inn, and it had an outdoor rooftop pool (and we got a coupon from the Visitors Center). 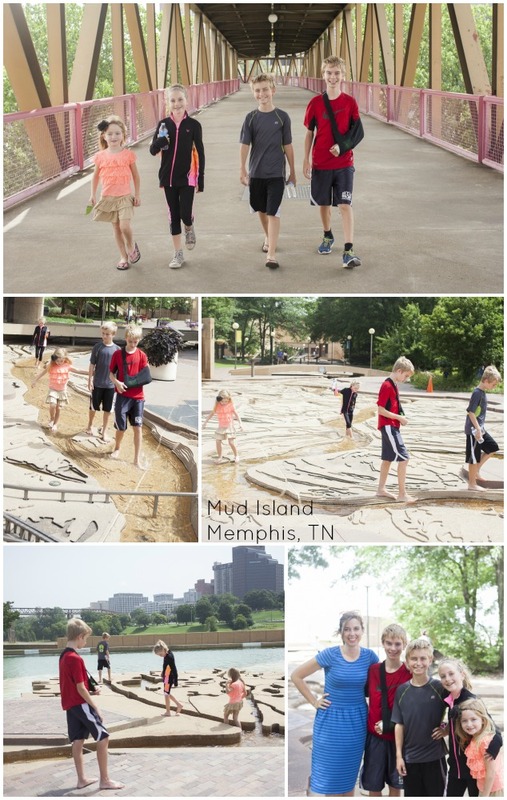 In the morning, we walked across a pedestrian bridge to Mud Island which is a small little island that sits in the middle of the Mississippi River in Memphis. It has a museam, and a huge replica of the Mississippi River and the cities that run along it. Kids walked the path, it was about as long as a football field. I love free and educational, and this was both. I actually didn’t know a ton about Elvis before, and really only was familiar with a few songs. I enjoyed the tour and learning about his rags to riches lifestyle, that was sadly cut short. 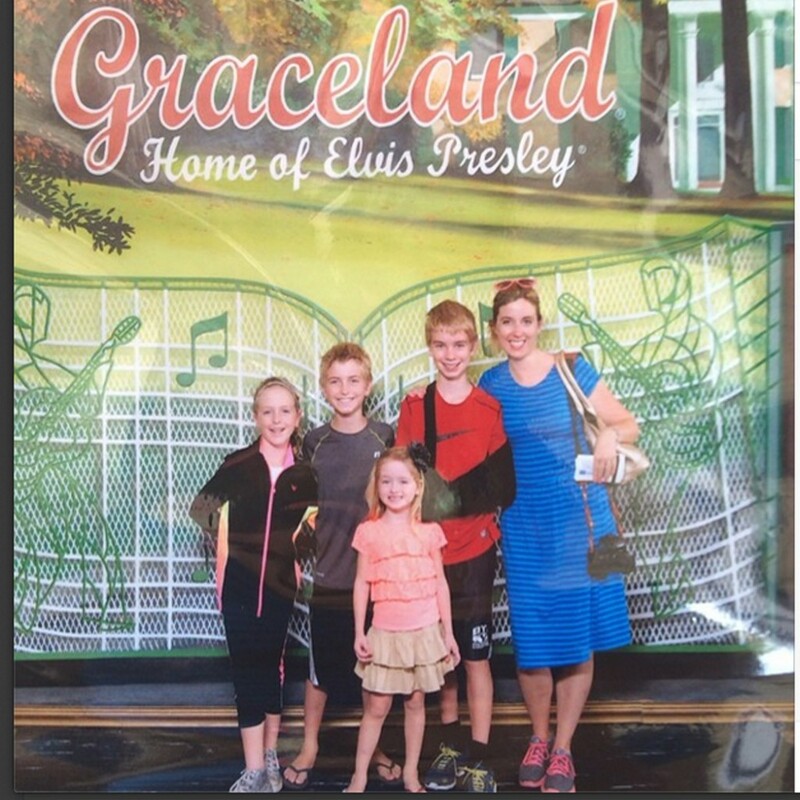 After we left Graceland, we headed out of town, and I got to meet up with a long time blog reader, Ava! 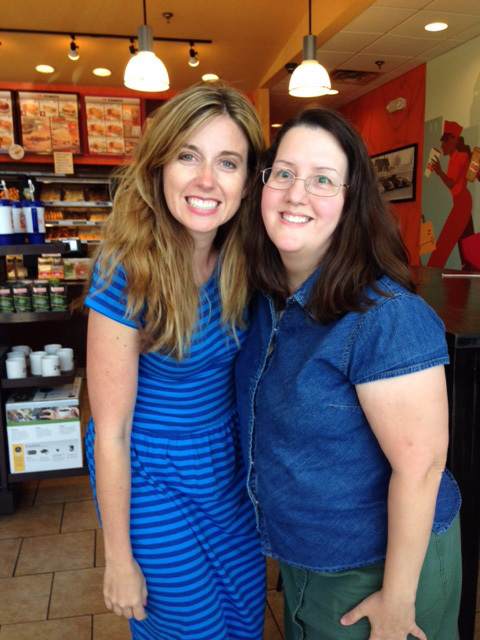 She met us at a donut shop with her daughter, and treated us to some yummies! I had been messaging her quite a bit about what to see and do in Memphis, and last minute asked if she was available to meet up. I’m so glad she was free! She brought her little one, and she and my youngest chatted away, too. It was fun to hear a bit of her life story, and she told me that after reading Say NO to Auto a few years ago, she now has her own photography business in Memphis! You can find her at Over the Mantle Photography. So if you are in Memphis and need pictures, give Ava a call! When I realized the Memphis Mormon Temple was just 5 miles away, I swung by there after donuts for a quick pic. 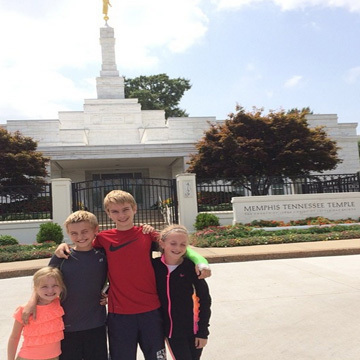 Temples are an important symbol in our faith, and though it wasn’t open when we stopped by, I love taking my kids to see them, as there are about 120 temples in the United States, and ours is a good 2 hours away in San Antonio. Only my oldest has gone inside to do work in our temples (age is 12 and up) but I take them to see them because I hope it is a lifetime goal and commitment to go often. Read more about the difference between our temples and churches HERE.